Year-round academic enrichment & support. Project Morry is a nine-year youth development program that offers year-round support and educational enrichment through the School Year program, which is run in conjunction with a dynamic summer camp experience, Morry’s Camp. Our School Year program offers educational and pastoral support as well as a consistent, positive presence for our students throughout the school year. 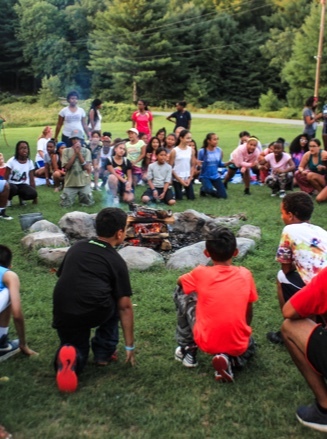 This presence aims to reinforce the important lessons and values learned at Morry’s Camp, that together make a positive impact on the day-to-day lives and future of our students. The core component of the School Year program is the monthly meetings and gatherings in the student’s community and at Project Morry’s headquarters. Individual meetings provide an opportunity to discuss each student’s progress and goals with them, and create plans to achieve them. Group gatherings are driven by our educational curriculum, and also include recreational and career-oriented activities. Once selected to participate in Project Morry, each student and their family are asked to make a commitment to multi-year involvement in our School Year program. Close contact and forming strong bonds of teamwork with parents and the community is key to our program’s success. Regular communication and outreach including newsletters, calls and emails which positively reinforce the lessons and values acquired throughout the program. Meetings with students, parents, teachers and social workers allow us to discuss any challenges faced by students and their families, as well as to celebrate milestones and special occasions together. The focus and activities of the School Year program are carefully aligned with the current educational needs and developmental stage of each of our students. To enable this, the program is divided into two phases, grades 4-8 (Under Grad) and grades 9-12 (Post Grad). Throughout the program, our curriculum emphasizes educational and vital work/life skills that will enable students to thrive in high school and beyond. Created around a 9-month, goal-oriented curriculum, our junior students set their own goals, overcome obstacles by identifying and utilizing personal and program resources, and experience self-confidence gained through these efforts. Each student is helped to develop their own ‘Passport to Success’ which tracks their progress through the School Year program. Additions are made to the Passport each month providing a compilation of writing samples, goals, challenges and ideas. Students are regularly encouraged to examine the consequences of their actions and the impact of their choices on their relationships with friends, families and their communities. At monthly meetings, our students are challenged to reflect on their lives and focus on their goals. Always thinking of the future, we support our students with life skills, time management, financial planning, SAT prep, resume writing, leadership development and public speaking. This is an elevated program that incorporates a high school specific education component, and a strong focus on preparing students for college and the workforce. Students are faced with a higher level of personal responsibility, freedom, the expectation of thoughtful decision-making and the requirement to demonstrate respect for one another. Challenged to examine their lives, students assess the consequences of their decisions, examine their motivations, and evaluate their short- and long-term goals. Through monthly gatherings with their peers, they explore challenges and successes with the group, and participate in a team building and leadership program. Project Morry’s Coach Program matches high school students with volunteer coaches who provide one-on-one mentoring over the course of two years. Coaches provide grade 11 and 12 students with a role model and give them the extra support, encouragement and motivation that they need to fulfill their goals and graduate high school. The program provides a safe environment for young people to share their hopes, dreams, and seek advice on addressing the challenges they experience at home, in school and in their communities.